According to Hoskinson, the crypto market is far from mature. In that case, he expects assets like Bitcoin to retest 2017 highs in the next 11 years. Even so, there are movements, and the failure of bears to drive prices below $3,500 is an endorsement for bulls. Charles Hoskinson is the founder of Cardano and the co-founder of Ethereum Classic. However, he is not shy to engage and give his two cents on important as well as contentious matters. Though he is unfazed by stagnating prices, he is optimistic and realistic at the same time. At the moment, investors are anxious, and as they wait for prices to rally, Charles is pouring cold water on their ambitions. In a recent interview at the Crypto Finance Conference, he said the crypto ecosystem should mature in the next 11 years. Like Amazon, a rebound will take time and patience is key. By his analysis, Charles has reasons to believe that prices will finally retest 2017 peaks in the next decade more than quadrupling its valuation. By then, there will be billions of users and crypto assets will be the hottest commodities with mega-valuation. BTC prices are stable. By extension, this means our previous BTC/USD trade plan is valid, and bulls are technically in charge. That’s notwithstanding shrinking transaction volumes and uneventful price action. As visible from the chart, Jan 22 bull bar is confining price action within its high low. 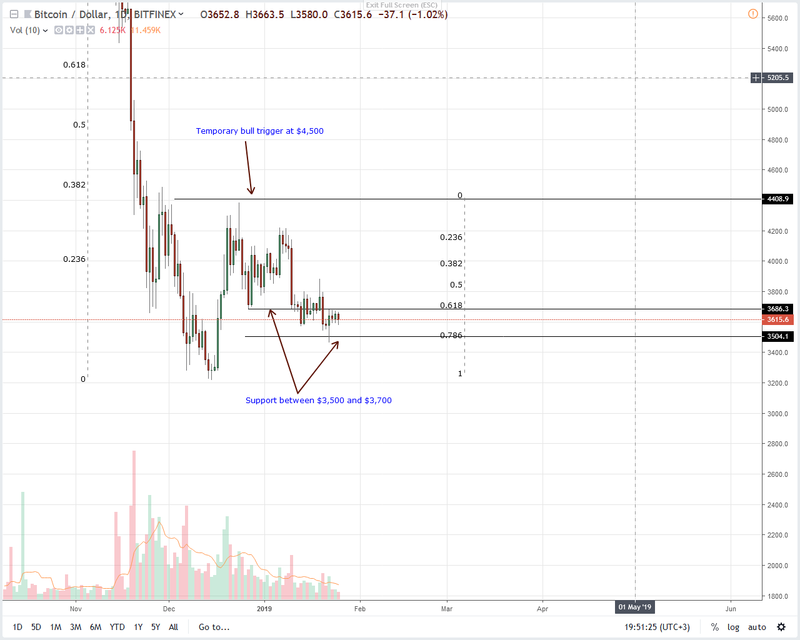 Therefore, unless otherwise there are noticeable gains above $3,700—the upper limit of our support, we shall stick to our last trade plan retaining a neutral stance. The only trigger that will cause trade initiation is a high volume close above $3,800. That’s around Jan 14 highs. Conversely, any drop below $3,500 shall trigger a sell-off forcing flight to safety—USDT or any other stable coin. Overly, we are bullish, but before we trigger positions, we should see an increase in market participation. That means a sharp spike in transactional volumes from current averages of 12k. Ideally, break and close above $3,800 or ($3,500) should be accompanied by a surge in participation pushing volumes above 35k.